Well, we’re back home and back to school, all in one fell swoop. Thankfully we’re over the worst of the jet lag by now. For awhile the girls were waking around 3 AM and then having a hard time getting back to sleep, which meant they were all practically comatose by 6PM. I kept having to coax them to stay upright just a little longer in the evening so that they could get back to Idaho time. Josh and Ben are doing well in public school so far, though I continue to have pangs feeling like (in allowing them their wish) I have deserted some of my responsibility to them. Funny how something that seems so normal to the vast majority of the world can feel so foreign to me. But I think they are doing OK, and of course it is God who is in charge of their life, not me. So I keep praying, keep talking to them about how things are going, and also now and then remind them that some of the questions I’m asking are not really a reflection on them, but simply me getting used to this new thing. 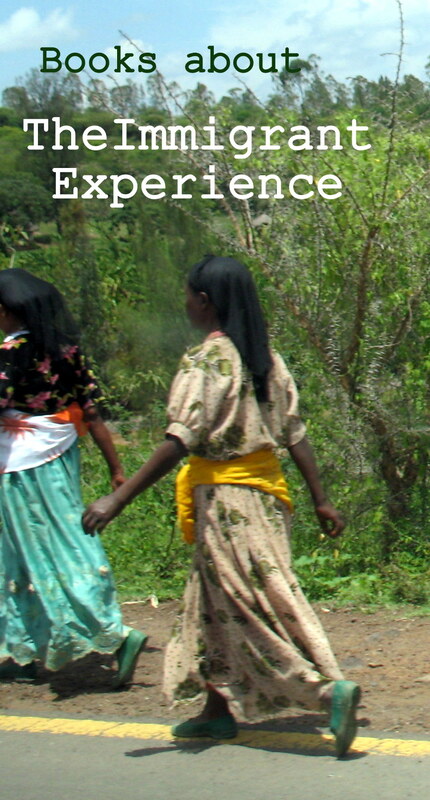 Jumping into school straight from 2 weeks in Ethiopia gave me an idea for a unit study with Emily, Julianna, and Zeytuna, my three homeschoolers this year. So many Ethiopians were happy our girls had come to Ethiopia to visit, but multiple times the girls were told to stay in America to live, as Ethiopians see America as the land of opportunity. Then of course we came home to read about all the refugees from Syria, and the terrible ways in which they are struggling to provide life and safety for their families. Many of them also are longing to come to America. Always in the past America has been seen as a place of refuge, a land that welcomes people who are struggling. I hope this will continue to be true in the future. I decided I really wanted our kids to learn a little more about the immigrant experience, and did an amazon hunt for some books that we can read together. Most of them talk about the immigrant experience from the point of view of children and teens. Four of the books tell the story of people who came to America via Ellis Island. Children of the Dust Bowl is the story of kids who moved to California during the Dust Bowl and how they dealt with the discrimination they faced in that move. A Long Walk to Water is the true story of one of the lost boys of Sudan. Esperanza Rising is fiction and tells the story of a girl who moves from Mexico to the United States. Inside Out and Back Again is the true story of a child who fled Vietnam after the fall of Saigon, and it is written entirely in poems. My plan is to begin with that last book, and to do a fair bit of the reading at lunch time to the girls while they eat. I am hoping that our fresh experience in another country might make these immigrant stories more meaningful to our kids, and might give them a deeper compassion toward people who struggle to find a place in this world. Excitement is building here for our trip to Ethiopia. It’s only a week away! I’ve been working on a packing list, and thinking about how to pack as lightly as possible while still being prepared for what is forecasted as a LOT of rain. We are also going to be traveling to several different places in Ethiopia, and the last thing we want to do is pack so much that it is miserable trying to schlepp our bags from place to place. We are aiming to have three large bags total for the five of us, along with one small backpack for each person. We’ll see how it goes! Here are some of the best tips I’ve discovered and collected over years of traveling to various places that I am planning to use as we pack for 16 days away from home. 2. Compress as much as possible when packing. I’ve found that rolling clothes up is a great way to fit more into less space. It also allows you to more easily see everything that you’ve packed, since clothes aren’t stacked. 3. Divide and conquer. Another way to keep your bags organized on a trip is to sort clothing by type and organize each type into smaller bags. This time around I ALMOST sprang for ebags, shown on the right. But when I priced out those adorable bags for the FIVE of us, I decided to go with my old stand-by–zip loc bags, which have worked great for me on previous trips. Three dozen 2-gallon bags cost a mere $15, much more within my budget, especially considering that five of us are going on this trip. I labeled the bags by type and by suggested quantity to create an effortless packing list for my two younger girls. For example, one bag says ‘3 pair pants’, another is labeled ‘6 short-sleeve shirts’. 4. Pack only what you love, and pack less than you think you’ll need. Most likely you can decrease the number of items packed by 20% without running short on a trip. And one of the ways you can decrease the amount of luggage you bring is by being willing to wash once or twice during the trip. Lightweight items wash and dry best– wring them out well after washing them in the sink. For even quicker drying, roll wet items in a dry towel and walk on the rolled towel for a minute or so to squeeze as much of the water into the towel and out of the clothes before hanging them up. You may even want to bring string and a few clothespins for hanging items. Or hang things on hangers on the shower rod. 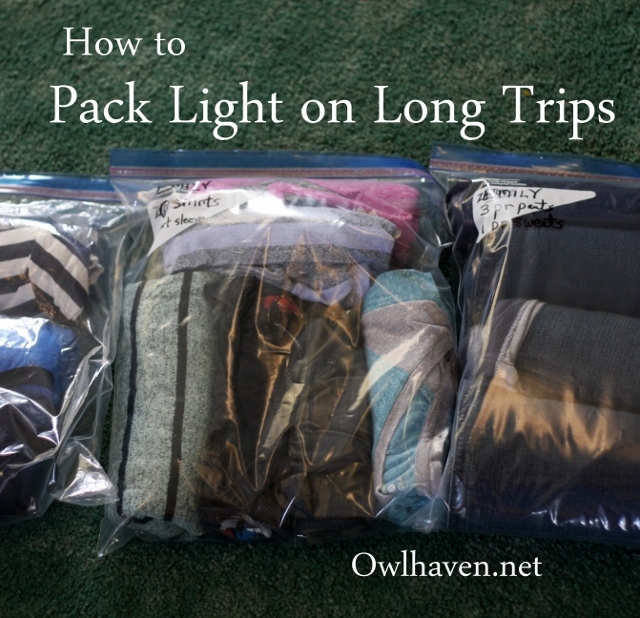 What do you do to pack light on trips? I’d love to hear your ideas too! A quick note about last week’s book giveaway. The winner is commenter #24, the mysterious ‘S’, who is a longtime reader. 🙂 Congrats! Email me your address and I will get your book headed your way. Always at this time of year, my thoughts turn toward school again. This year if I’m figuring it right, we’ve hit the 20 year mark as a homeschooling family. 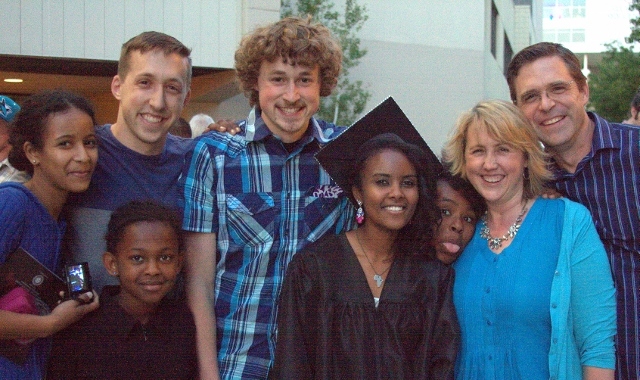 We haven’t exclusively homeschooled: our oldest daughter went to private school for her first two years, two others had several years of public school in Ethiopia before they joined our family, and most of the teens have done a bit of college while still homeschooling. But when I did the math for two decades of teaching 10 kids, I came up with something like 97 total years of homeschooling. Crazy, right? 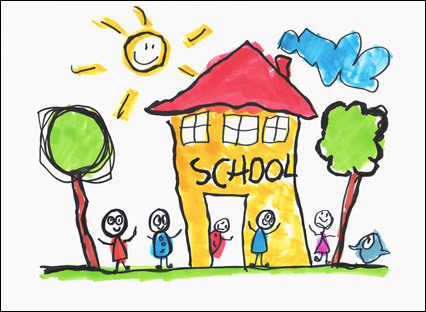 All along we’ve done our best to tailor each child’s education to his or her needs. Well, this year we’re taking a brand new path for two of our seniors. Josh and Ben have for several years been asking to go to public school. For years we’ve chosen to stick with homeschooling, adding college classes into the mix the last 2 years to liven things up a bit. But still they’ve been longing for the whole high school experience. So after lots of prayer and lots of discussion John and I decided to let them try public school for at least a semester, and if all goes well, for all of senior year. Whew, it was a hard decision for this momma. 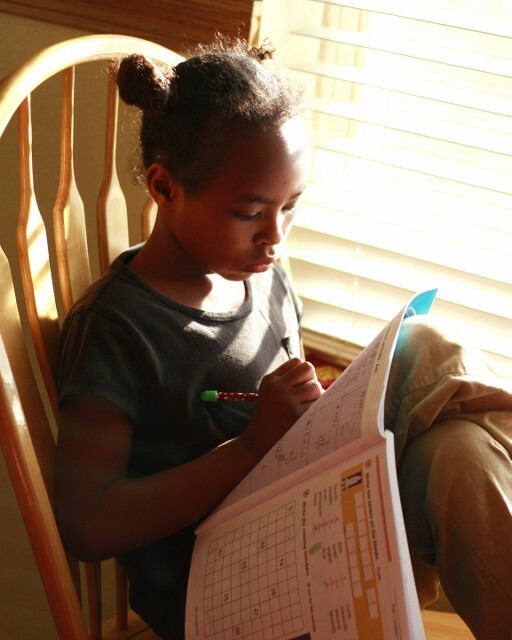 Homeschooling has overall been an excellent path for our family. It has grown the boys well too, both in their faith and in academics, enough that we’ve been talking for awhile about letting them graduate early. Sure, they have maturing still to do; no kid has everything figured out at 17. But John and I ended up deciding to hear their wishes, trust their common sense, and let them have this adventure. I suspect that sitting in classrooms hour after hour it will be more boring than they’re imagining. But there will also be new and different opportunities. Josh is interested in Spanish 3, and in some of the music offerings at the school. Ben would love to learn welding and auto repair, among other things. So we’re sending them off. Josh starts school the day the girls and I leave for Ethiopia, and Ben starts just a few days later. We are praying this ends up being a blessing and a positive experience for them. Zeytuna (last I chatted with her) was still steadfastly insisting she prefers to stay at home for her senior year. I’ll also have Emily (grade 8) and Julianna (grade 5) still. So our home school tradition this year will continue with three students, just as we had our very first year of school so many years ago, when all the kids were little. We’ll also be starting a little later than usual, in mid-September, since the first two weeks of the school year will be taken up by our big trip to Ethiopia. Life is just full of adventures! I’ll keep you posted as to how all these adventures go. Meanwhile, it’s back to packing for Ethiopia, and getting the boys registered for school. If my to-do list is any indicator, both these events take lots of doing! Speaking of new adventures, if you’d like an occasional ‘insider’ update from the Owlhaven, just enter your email address in the right-hand sidebar above, and click the ‘subscribe’ button. Once every month or two, I’ll be sharing just a few extra newsy highlights from our life– fun things that won’t necessarily all make it to my blog. I’d love it if you’d join me there! And if you’d like to read my best homeschooling tips from two decades of homeschooling, check out my latest book Practical Homeschooling for Real-World Families, available on Kindle. The bad news is, turns out this is NOT a week for frequent blogging. Along with two full night shifts, and half a night when OB was short-staffed and I helped out for a bit, I got to do two days of ACLS (advanced cardiac life support) certification. The good news is if you collapse in front of me and your heart isn’t clicking right along, I’ll go right into chest compressions, all the while hoping that the rest of the folks running into the room will remember whether your heart rhythm warrants epinephrine or dopamine or amnioderone. I may even remember to stand clear when they get ready to juice your heart with a nice fat shock. Whew! But an 88% is a pass, even if it’s not all perfectly cemented in there, so I’ll take it. A 10.5 year old is hard to shop for. At least my 10 year old is! She’s all anxious to look like a big person, and I’m feeling like, ah….this is one of my last chances to buy her a little-girl dress. But of course the dresses that looked like they were designed for a 25 year old were the ones she was drawn to, like a lemming to a cliff. (No…….!) We were working at cross purposes for awhile there. In other news, wedding planning is in full swing. On the agenda for this afternoon is the testing of the Christmas lights so that the shaded area where the reception is to be held will be properly awash in twinkle. Wish me luck to find (hopefully) a few that actually work. Because buying Christmas lights in July is ridiculously spendy. Also, if you happen to live in these parts and have some good lights you’d be inclined to loan, I’d love ya forever. I’d even label them with your name and come pick them up from your house. And return them to you in a week or two or six. Definitely before November, anyhow. Today we’re having fir fir for lunch, which is a delightfully spicy Ethiopian dish comprised of injera, butter, onions, shiro and LOTS of berbere. Spicy fabulousness…… I am absolutely LOVING the fact that Boise now has an Ethiopian restaurant —Kibrom’s— yummy!!! Also today we got these!!! 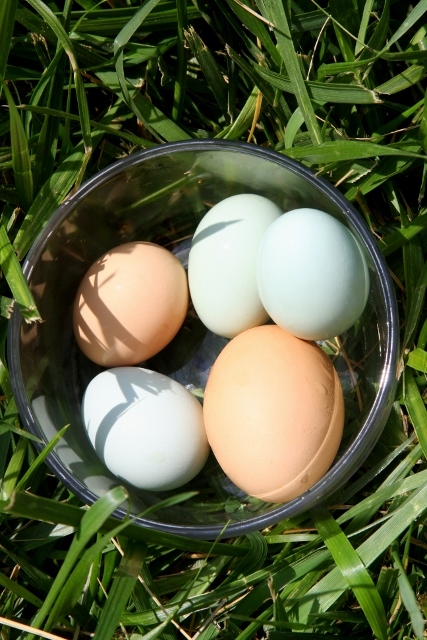 Our spring chickens have already started laying eggs, and finally, finally, after years of wishing for eggs in Easter-egg colors, we have them! The type of chicks we got are Araucanas. We got 20, and it’s looking like only 4 of them are roosters. So between the new hens and our 7 old hens, we should be utterly swimming in fresh eggs. Such fun. I’m really surprised they are already laying– I was totally psyched to wait til fall. And aren’t those baby eggs cute? Once the hens have matured a bit more, the eggs will get a little larger, tho this breed does not lay really big eggs. That’s about it from here. In a few days I’m planning on posting my mom’s fabulous gluten free bread recipe, so stay tuned! Just stopping in quickly to wish you all a very blessed Mother’s Day, and to share a photo from our daughter Lidya’s graduation this weekend. After a year and a half of hard work, she earned her technical certificate in dental assisting, and we’re so proud of her! Will you all please pray for my friend Lisa and her family? She and her husband and daughter were in a car accident on Saturday and lost their precious, much-loved daughter. 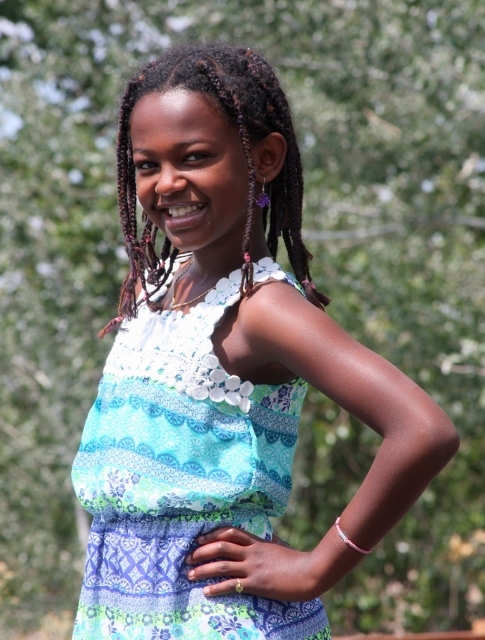 She was born in Ethiopia and came home to them eight years ago. My heart breaks for them. Hug your precious ones. 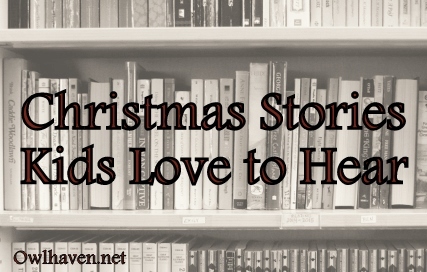 Need a new Christmas story? This post contains affiliate links which means that if you click through and order, I will receive a few cents from Amazon. This helps support all the free content here at Owlhaven, but doesn’t add a cent to your cost. Thanks so much for purchasing! And by all means, feel free to add your own book suggestions in comments, below. I wanted to tell those of you who are interested a little about my latest book Forever Mom: What to Expect When You’re Adopting . It is coming out on October 28th, and I must confess to a crazy mix of excitement and tremulous nerves about this book. My greatest longing is that it will encourage and equip moms along this adoptive parenting journey. This book is very vulnerable, a true window into my heart as an adoptive mom. There’s been so much joy– adoption is an incredible gift– but also much struggle, much lurking fear that I wasn’t doing this hard job well enough. But praise God, He’s been strengthening and growing me all the way. Even as I wrote about our journey, God was gifting me with more growth, more compassion for my precious ones, and a greater ability to more clearly see my own personal ‘stuck’ points. I’ve come to a much better place as a mom, better at releasing my desire to control outcomes and speed healing and growth, instead leaning on God’s providence in my kids’ lives as well as my own. But wow, it has been a long hard path. I hope that sharing my struggle will help other moms know they’re not alone, and that there is a way through difficult waters. If adoption is a topic that interests you or you’d like to read more of our story, I hope you might consider pre-ordering Forever Mom? If you know me, you know I feel really funny about doing the pushy sales-person thing. But in the publishing world, all pre-release sales on amazon are counted as first-day sales of a book. It really helps a book gain more attention (and more orders in stores and from libraries) if those first-day sales are strong. I’d love for this book to be widely available to prepare moms before adoption and to come alongside mommas who may be struggling, letting them know they’re not alone. And here’s some really fun news– everyone who buys Forever Mom before November 4th gets some neat freebies! 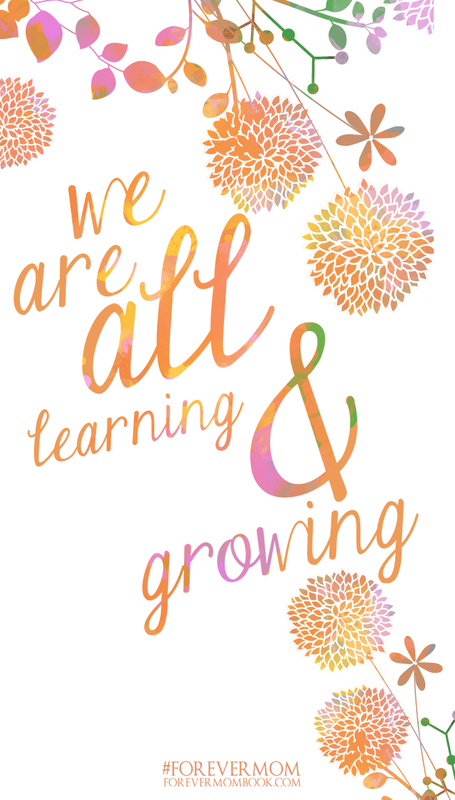 Freebie#3- all 8 of those same custom prints as phone lock screens/screensavers! To get those freebies, just send proof of purchase (ie- receipt, order confirmation, etc) to ForeverMomBook@gmail.com, and the free package will be emailed to you. Feel free also to share the video and graphics below, either on your blog, pinterest, or on facebook. Thanks so much for your support!! OH my goodness. I am so very out of it, people. I feel like I haven’t been here on the blog forever. I have NO frugal things to tell you about, no recipes to share, no wise thoughts. So I think I’ll just catch you up on what’s been keeping me so darned busy. I mentioned that last weekend I went to a retreat in the Seattle area, a lovely precious time. 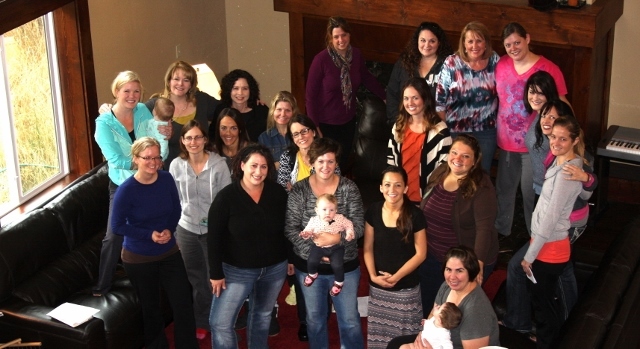 It was so wonderful, in fact, that I felt intimidated, expectation-wise, about the retreat I’ve been planning for some other adoptive moms in McCall. The Seattle retreat was very low key. No real agenda except fellowship, conversation, and a few times of Bible study. It was just wonderful, so relaxing. 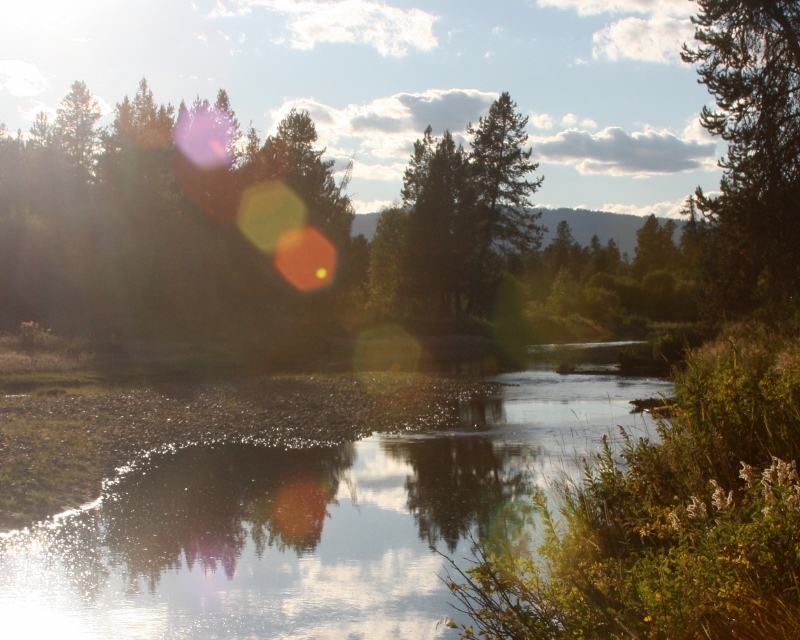 I had been planning my retreat in McCall to be more structured, since I’d been planning to share some DVD’s from the Created for Care conference that I attended in Atlanta last spring. And, frankly, there was this tiny fear that I’d get all these lovely people gathered together, and then have no idea what to do with them. That they’d stand around bored, making stilted, polite conversation, the kind that happens in a room full of strangers. Which they mostly were, before this weekend. So my subconscious thought was to keep them busy. When I came back from the awesome retreat in Seattle, I decided McCall needed more empty space, more time just to BE. I ended up sharing just three DVD’s. The rest of the time was free for visiting and talking. And, praise the Lord, my worrying about them not enjoying the time was totally unfounded. The talking started instantly and never let up the whole weekend. Very little sleep was had, but, oh, the conversations we had. It was just a constant roar all over the house. SO rich. So good. I felt almost apologetic interrupting those conversations to gather everyone together for the DVD’s. But it turned out that those were appreciated as well; talking together on the last day many moms mentioned good tidbits they’d gleaned from the DVD presentations. I really should not have worried. They were a really, really neat group of ladies. And God was obviously right there in the midst of us, personally meeting our needs in such encouraging ways. I am so thankful to have gotten to know each of these ladies better. And if you can believe it, this group of 21 ladies has a combined total of 102 children. Neat, huh? These mommas represent a combined total of 102 children! As you can see in the photo, there were also three infants in attendance, who did a great job tolerating our noise and managed to sleep and nap OK in the midst of it all. The house where we stayed turned out to be really neat too. Here’s a link if you’re interested– I’d highly recommend it for anyone planning a retreat for up to 30 or so people. My wonderful husband John came along, and did a TON of work in the kitchen so that I could really just sit and visit and enjoy the retreat myself as well. Due to the late nights, I suspect that nobody went home very well rested. But we had a really great time getting to know each other. Such a blessing. I hope to get back to a more regular blogging schedule this week. I have some Stitch Fix clothes to tell you about, and a recipe to share. I also really need to get back to my old frugal ways. Being crazy-busy is just not very conducive to thoughtful spending, ya know? Hope you had a good weekend and are doing well! In the midst of the challenge of parenting many teens, inevitably there are moments where my kids see me as enemy number one, the one thwarting their dearest-held wishes. Moments like these frustrate me as much as they frustrate them. I want them to be happy and to grow in wisdom, and to never doubt my love for them. I do my best to make decisions with those goals in mind. (OK, sometimes I want to stay home for an afternoon instead of running kids everywhere.) But the vast majority of my decisions truly are motivated by love, so it can be incredibly frustrating to be seen as the enemy. There’ve been moments where I’ve outright told them that they’re not going to find a bigger fan on this earth. That I’m ALWAYS on their side. Yeah, sometimes being on their side looks like making them sit next to me and talk through a confusing assignment when they’d rather go to bed. Sometimes it means them having to dig through the pit on their bedroom floor before they can use the phone. Or finishing their math before they can hang out with friends. Which to a teen doesn’t feel like love. And there lies the problem. It’s not enough for me to be certain of my intentions and feelings for them, and to be making decisions in love. If I’m not loving them in ways that feel like love to THEM, it honestly doesn’t matter how much I love them. Now, don’t get me wrong; most well-bonded, reasonably mature kids understand that moms make kids do un-fun stuff for their own good, because they love them. But (adoptive momma alert here) kids from hard places often have a terrible time interpreting a mom’s less-than-fun decisions and actions as loving. In seeking to love my kids well, I can’t be a complete and utter push-over. It’s good and needful for me as a mom to make my kids do chores and memorize times tables and wear seat-belts. But at least part of the time (hopefully even a few times a day?) I also need to be loving each child in ways that make that particular kid feel loved. For one of mine, it’s gummy bears. For another, it’s a cup of coffee, set down right next to that textbook. For another, it’s being allowed to chat on the phone, a lot longer than I strictly think is needed. Another happily snuggles in next to me on the couch for little chats. Another likes to paint fingernails with me. Yet another grins when I playfully punch him in the ribs as I’m walking past. Especially during the teen years, it can be very easy for the negative interactions to start to outweigh the positive. I’ve found I need to be very observant and very intentional in fitting in positive interactions too, or it all goes downhill fast. 1 John 3:18 says, “Dear children, let us not love with words or speech but with actions and in truth.” I think especially when kids are struggling, they really need to see our actions, and so I’m always trying to add ideas to my repertoire. What does love in action look like at your house? 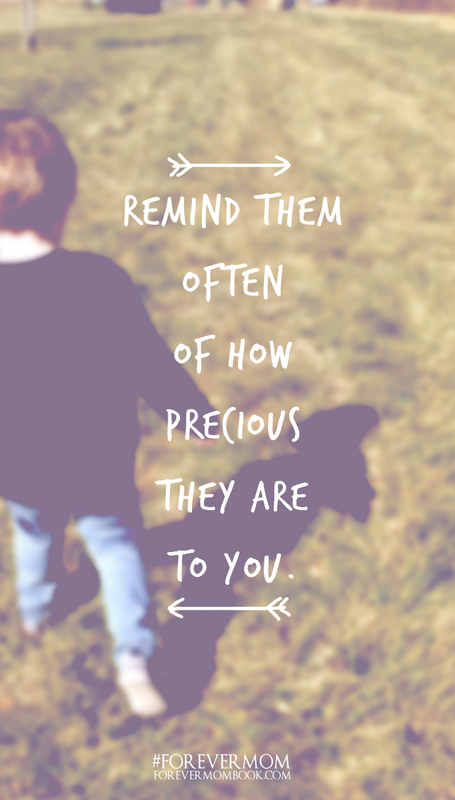 I’d love to hear what actions make your children feel especially loved.